Once on the master video list page, you can select the instructor(s) you would like to view, click "apply" and it will show all the videos from that instructor. You can select groups by holding "shift" + clicking the mouse, or select individual by holding "control" and clicking each additional instructor that you'd like to add. You will then be shown the filtered results, which show the video description, along with the membership level the video is available to, either standard or premium (note: standard videos are available to all premium users as well). In the section labeled "Containing any of the words" you can now type in specific tags. The most useful tags will likely be a buyin tag. Each video that is posted on the site is tagged according to buyin level, among other things. The way this works is that the buyin and the rake are combined to put a final number. So if you're looking for $11 + .50 level videos, you would put $11.50 into the box. You can do the same thing with networks (examples would include PokerStars, Full Tilt, Bodog, Cake, Ipoker). 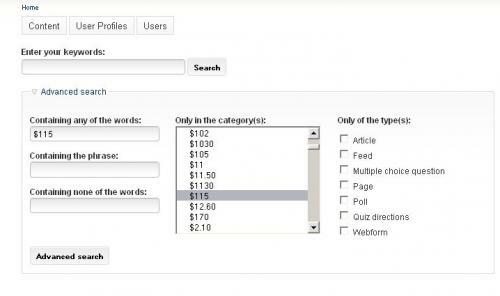 You must also click the relevant category to the right of the search boxes. 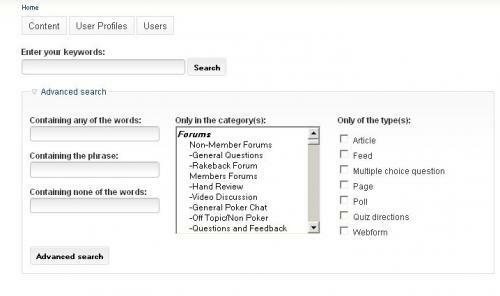 If you scroll down from the "Only in the category" box that begins with Forums, you will see many tags, including common buyin tags. In the example below, you can see where I've typed in "$115" which would search for all videos played at the $110 + 5 level. I've also clicked the category for $115. Picture one shows the search box category selection while picture two shows the results that are returned after clicking "Advanced Search." You can see in the picture below that the search returned results of videos played at the $110 + 5 level. If you actually perform this search, you will find over 4 pages of videos from this level. You can play around with the advanced search feature to find a lot of specific material on this site. Let us know if you learn any helpful tricks! Below you'll find a list of categories. Under each category are specific videos that are relevant to the category topic. Generally, newer and higher rated videos are listed closer to the top of each category. However, the rating system and release date are not strong enough indicators of quality to judge alone, so make sure you explore any videos that might fit your search criteria. This will be an ongoing guide, look at the bottom of the article for the most recent date this was updated along with the specific videos and sections added to this guide. It's important that members do NOT start out by just watching videos of games at their levels. The flaw in that approach is that games a few buyins below and above your level are often applicable to the games that you play in. To fully utilize the value of this site, you should choose the best videos from your buyin as well as the next one or two buyin levels above and below your level. The following are good heads up sng videos for beginner level players as well as any players that want a starting point for specific concepts such as bluffing or playing aggressive opponents. Each video listed below is available to both standard and premium members. Cog Dissonance Postflop Play - A powerpoint introduction to postflop play for beginner and intermediate players, then a review of hands and various ways to play them against specific opponent types. Fydor_8 HUSNG Leakfinder 11/05/10 - Discuses concepts essential to beginners such as value betting, effective stacks and bet sizing. PrimordialAA Heads Up SNG From Scratch 1 - Discusses concepts essential to beginners, good starting point video with both powerpoint and gameplay demonstrations. PrimordialAA Heads Up SNG From Scratch 2 - An addition to the video above demonstrated by replaying and reviewing a match. RyPac13 Video 35 - $10 + .50 level leakfinder with discussion about preflop raise sizing, decision making approach from the start of the match and some adjustments against passive opponents that start to show some signs of aggression. Skates Video 01 - Discussion of exploitive play and playing an aggressive basic strategy demonstrated at the $11 + .50 level. Skates PS, I'm Playing Microstakes - Skates plays a very exploitive style against four different opponents at the $6 + .25 level. ITRIED2WARNU Video 33 - Review of a member at the $10 + .50 level. Highly rated beginner leakfinder. HokieGreg Video 04 - HokieGreg plays at the $11 + .50 turbo speed level and covers a wide range topics valuable to low stakes players. xSCWx Video 25 - A match against a passive player at the $11 + .50 buyin level. Fydor_8 Leakfinder 7/11/11 - Review of $15 turbo speed game, includes discussion on hand ranges, hand value and thin value bets. Fydor_8 Leakfinder 10/16/10 - Review of a student's play at the $6 + .25 buyin level. Good information for newer or struggling players. Fydor_8 Leakfinder 5/31/10 - Review of a student's play with discussion about "small ball" heads up poker strategy, leading with bottom pair in limped pots and basic hand reading. PrimordialAA Archive 07 - A video that reinforces fundamentals essential to low and entry level mid stakes players. Fydor_8 Video 14 - Review of a student's play at the $22 + 1 turbo level. Lengthy discussion about adjusting to bad players, value betting and playing small pots with small hands. Good basic video for any lower stakes or beginner players. RyPac13 Video 05 - RyPac two tables the $11 + .50 regular speed level. He discusses a bad decision that he made, reflecting on it after the game. This video contains some tips on how to consistently review and analyze your play. Fydor_8 Leakfinder 9/15/10 - Review of a member's play at the $20 + 1 regular speed buyin level. Fydor_8 Video 12 - Review of member bwtaylor. Discusses the most basic leaks and adjustments that beginner players have. Fydor_8 Video 13 - Leakfinder against a tight passive opponent. If you're struggling against players that do not often bet nor raise, this is a good video to watch. PrimordialAA Video 25 - Solid aggressive strategy for Full Tilt regular speed games. Video takes place at the $22 + 1 level. Fydor_8 Leakfinder 7/03/10 - Good basic advice for beginner players. PrimordialAA Heads Up SNG From Scratch (Intermediate 1) - Powerpoint demonstration on adjustments that players need to make when moving out of the low stakes games. PrimordialAA Heads Up SNG From Scratch (Intermediate 2) - An addition to the video above. Skates Video 02 - Thin decisions and the rule of traps in heads up sngs is discussed at the $11 + .50 level. HokieGreg Video 07 - HokieGreg two tables $33 + 1.50 turbo speed games. He discusses preflop ranges and sizing, bluffing on dry boards, limp raising and other concepts that beginner to intermediate players can gain value from. Skates $11.50s - RyPac joins Skates for matches played at the $11 + .50 level. If you enjoy this video, the two team up again for videos at the $22 + 1 level. Part 1 and Part 2 can be found by clicking on each. Fydor_8 Leakfinder 7/19/10 - First 20 minutes is good beginner advice, while the last part of the video dives into concepts that can help beginner players take their game to the next level. xSCWx Video 18 - Adjustments and getting the most out of your value bets are both discussed during two matches at the $33 + 1.50 level. Skates Video 03 - $22 + 1 level matches with topics such as polarization and confidence. Skates Video 04 - $22 + 1 level matches with topic such as betting frequencies, in depth hand reading and drawing conclusions. Also thoughts on how to play against an unknown player. RyPac13 Video 20 - 3rd part of a "Regular Speed Series." The match takes place at the $20 + 1 level and talks about how to adjust to a less predictable opponent, staying aggressive and trying to put your opponent "into a box" (narrow, limiting strategy). Cog Dissonance Video 44 The Importance of Focus - 22 minute video designed to help improve beginner and intermediate player weaknesses. Good for players that often get frustrated or "tilted." RyPac13 Video 12 - RyPac discusses dealing with negative variance. While the video takes place at the $110 + 5 level, it is absolutely applicable to low and mid stakes players alike, as it also talks about getting the most out of your losses and gives insight into long term goals rather than short term, short sighted results-oriented mindsets. Fydor_8 HUSNG Leakfinder 12/09/10 - Discussions of what various bet sizes mean from opponents, focusing particularly on min bets. RyPac13 Video 10 - RyPac plays with his hole cards blocked in three matches. He talks about using the texture of the board an opponent's actions to help you decide whether or not to bluff. ITRIED2WARNU The Concept of Bluffcatching - ITRIED2WARNU breaks down the concept of catching bluffs in this video. There is powerpoint, followed by hand analysis as he explains the important factors in determining whether or not your opponent is bluffing. ITRIED2WARNU Video 24 - A hole card blocker is used to focus on player tendencies and board texture. Play is more aggressive in this video. Fydor_8 Leakfinder 7/22/10 - Basic fundamental advice throughout the video. At about the 33 minute mark there is good discussion on the importance of following through on bluffs. Barewire's Early Fiesta - Discussion of overbetting and other important concepts at early blind levels. Part 2 extends concepts against aggressive regular. mjw006 Donk Betting Concept Video - A breakdown of how to respond against donk bets, specifically when an opponent leads the flop out of position in a raised pot. Powerpoint is primarily used in this video, with a few hand demonstrations. Skates Video 05 - Included in this video played at the $34.50 turbo speed level is discussion on how to handle donk bets from your opponent. RyPac13's Aggressive Leakfinder Series Part 3 - RyPac reviews play against an aggressive opponent. He explains that long term leaks can result from overplaying weak draws, discusses 3-bet ranges, the flexibility needed against wide open raisers and how to use aggression to fight aggression, specifically in the short stack area of the match. Fydor_8 HUSNG Leakfinder 11/01/10 - Discussion at the $33 + 1.50 turbo level facing a loose aggressive opponent. Discussion includes adjustments against the LAG, avoiding the common flaws like weak and passive adjustments and some suggestions of non traditional adjustments to help exploit this opponent type. RyPac13's Aggressive Leakfinder Series Part 4 - Discussion during leakfinder review about combining early reads with general playerbase observations to make superior decisions. Continuation bet size manipulation and the importance of not over reacting to early aggression are also discussed. Skates Video 01b - Passive preflop play against a loose aggressive thinking opponent at the $33 + 1.50 turbo speed level. Cog Dissonance Video 43 - Cog Dissonance discusses his decision making while playing three aggressive opponents at the $10 + .50 level. RyPac13 Video 27 - The importance of recognizing early opponent actions is discussed as well as the impact that they have on your adjustments throughout the match. Limping vs raising, multiple street bets and bet sizing are also discussed. The video is a review of a student facing an aggressive opponent at the $33 + 1.50 level. RyPac13 Video 28 - Part 2 of Video 27's review against an aggressive opponent at the $33 + 1.50 level. Mid to end game concepts against aggressive players come up. Considering new information into your overall decision making as the effective stack sizes decrease is also discussed. Cog Dissonance Video 27 - Majority of the video is against a tight-aggressive opponent. The last match is shorter and against a loose-aggressive opponent. RyPac13's Aggressive Leakfinder Series Part 2 - Leakfinder review that covers reactions to large bet and raise sizes from your opponent. Also talks about some quick adjustments against aggressive players that can be effective. Video 1 is against a less aggressive opponent but should provide value to those that enjoyed parts 2-4. Cog Dissoonance Video 17 - Cog Dissonance's Heads Up Fundamentals Course is featured in this video, a private coaching course he used to run for students to teach them basic adjustments against main player types. The "Tight" course is featured in this video. Skates Video 01a - $33 + 1.50 turbo level match against a very tight opponent. The transition from more passive play into "bet, bet, bet" is made as the opponent continues to play tight. RyPac13 Video 15 - Slideshow packed with tips and information on how to beat tight heads up sng players. A review of professional 1690AD/Nathan and his play against a tighter opponent is followed. These videos introduce key concepts of the end game, or short stack portion of heads up play. Mersenneary Video 8 - Student footage is used to introduce basic end game theory. Discussion on how continuation bet sizing from the small blind and preflop flat calling ranges from the big blind change when playing at short effective stacks. RyPac13 Video 09 - RyPac goes over the basics of the end game with a hand by hand demonstration through a replayer. He then plays a pair of matches to demonstrate some of the concepts he discussed. This video references the NASH Equilibrium. Fydor_8 Video 11 - Fydor reviews a student's end game in this video. The visual quality of this video is sub par, however the content quality is very high for beginner players. PrimordialAA Video 20 - End game concepts demonstrated on the original Full Tilt super turbo structure (10bb effective starting stacks), including some math and graphs at the end of the video. PrimordialAA Video 21 - End game concepts demonstrated on the Cake network's super turbo structure from the $12 to $250 buyin levels. *Note* Deep stack videos are most cross applicable to heads up cash strategy since deep stack structures usually take place with 100 to 200 starting big blind stacks. You can also use heads up cash videos to help you with deep stacked heads up sng strategy. Barewire's Deep Stack Part 1 - A deep stack heads up cash specialist presents a slide show, along with some selected hands to demonstrate essential concepts for playing in deep stack heads up sngs. Barewire's Deep Stack Part 2 - Concepts covered in the first video are demonstrated in a $100 + 5 level deep stack match. Cog Dissonance Deep Stack Series 1 - Initial deep stack series video at the $5 + .25 level on Full Tilt. 150 effective big blind starting stacks are in this structure. Cog Dissonance Deep Stack Series 2 - One match takes place at the Full Tilt deepstack structure's $20 + 1 level, while another takes place at the $30 + 1.50 level. Brilliant27 Deep Stack - Patience, simple value adjustments and other concepts from a successful veteran of this format are discussed at the $20 + 1 level. The following videos are good introductions to super turbo or hyper turbo heads up sngs. End game videos can be applied to super/hyper turbo strategy and vice versa. This is because super/hyper turbo heads up sng structures only take place in short stack situations, commonly referred to as "end game" situations. Cog Dissonance Super Turbo Heads Up SNG Guide - Good primer for players starting out in this structure. Powerpoint slides with concepts are featured as well as hands being replayed in between slides to demonstrate various concepts. Cog Dissonance Super Turbo Series Part 1 (Starting out) - $2 + .10 level super turbo games are played. Cog Dissonance Hyper Turbos - Cog plays the $7 hyper turbo level. Cog Dissonance Video 58 - Talks about limping buttons, among other concepts, at $20 super turbo level. Cog Dissonance Super Turbo Series Part 2 - $5 + .15 and $10 + .25 level super turbo games are played. Mersenneary Video 23 - Discussion about a ~$100,000 profit month for Mersenneary followed by using information in holdem manager and poker tracker to make yourself a better heads up sng poker player. Stats that matter and stats that don't matter are explained as well as an approach on mitigating tilt. Free Introduction: Transitioning From Heads Up Cash to Heads Up SNG - Barewire and Skates discuss the similarities and differences between heads up cash no limit poker and heads up sit and go poker. Common misconceptions and myths from players not familiar with heads up sngs are discussed as well. The following videos are recommended for players with a basic understanding of heads up sng strategy. Viewers should ideally have had some success at the $5-33 buyin levels before viewing. Videos that are only available to premium members will be labeled as such after the title link, videos not labeled with such a tag are available to both standard and premium members. mjw006 Beating the MidStakes Part 1 - Opening video focuses on fundamental play, the importance of having a solid, sound strategy as you approach the mid stakes heads up sng games. Topics such as hand value, positional value, raising, continuation betting, board texture, hand reading, bet sizing and range consistency are discussed. Over 20 minutes of powerpoint slides going over these concepts followed by four matches at the $33 + 1.50 level on PokerStars demonstrating the concepts discussed. mjw006 Beating the Midstakes Part 2 - 25 minute powerpoint presentation followed by 45 minutes of gameplay focusing on read based play in heads up sngs. Developing accurate reads, using reads to implement exploitive strategies, narrowing reads to better define ranges and the topics of perception and deception are discussed. Gameplay is at the $30 + 1.50 buyin level. mjw006 Beating the Midstakes Part 3 (Powerpoint) - 30 minute powerpoint presentation focusing on upping your level of aggression in heads up sngs. The types of aggression that are appropriate when playing in 3bet pots, betting on multiple streets and check raising is also discussed. mjw006 Beating the Midstakes Part 3 (Gameplay) - The concepts discussed in the powerpoint part of video 3 are shown in replayed hands, with the addition of bluff catching and playing against aggressive check raisers. Skates Board Texture Part One - A review of individual hands submitted by HUSNG.com members with emphasis on board texture. Skates Board Texture Part Two - Similar to part one, an essential video for players that want to take their hand reading to the next level. 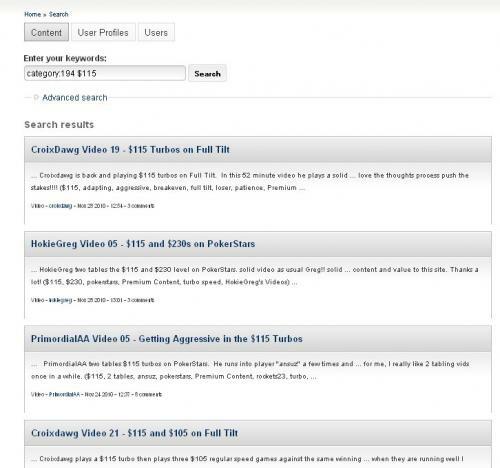 HokieGreg Video 24 - Leakfinder for HUSNG.com member "LakeCoveKid" at the $33 + 1.50 level. HokieGreg Video 16 (Premium Membership) - Two tables at the $55 + 2.50 and $110 + 5 level with a lot of interesting spots. PHMERC in Mid Stakes - PHMERC two tables $60s and talks about making optimal decisions against typical mid stakes opponents. ITRIED2WARNU Video 26 - A leakfinder video taking place at the $50 + 2.50 level for the winner of the free member leakfinder contest, "ConcreteDonkey." xSCWx Video 53 (Premium Membership) - Three matches at the $115 level that talk about adapting to opponents, bluff raises and hand ranges. xSCWx Video 54 (Premium Membership) - Two matches at the $115 level that talk about inducing bluffs and hand ranges. HokieGreg Video 06 (Premium Membership) - Discussion of min 3-bet pots and playing draws (often with aggression, particularly out of position) among other intermediate level instruction. This video takes place on two tables at the $55 + 2.50, $110 + 5 and $220 + 10 buyin levels. Viewers should have a basic understanding of end game strategy from studying the end game videos listed in the beginner section of this guide prior to viewing these videos. *Note* All the videos in the advanced end game section and below are available only to premium members. Mersenneary Video 1 - Discusses everything about end game strategy. A powerpoint presentation with key concepts followed by over 40 minutes of play against opponents, most notably instructor Fydor_8. Matches take place at the super turbo heads up sng structure on full tilt, where the effective stacks start at 25 big blinds. Mersenneary Video 6 - Focuses on advanced end game strategy from the small blind. Instruction on incorporating minraising and limping ranges to exploit population tendencies more effective than the NASH end game chart. Mersenneary Video 17 - Focuses on advanced end game, particularly exploitive strategies from the big blind (similar to video 6, except from the big blind). Instruction on exploiting button open raise frequencies, 3-bet bluffing, dealing with frequent limpers and play at awkward stack sizes. Mersenneary Video 18 - High stakes end game is displayed at the $500 + 6 super turbo level. Concepts from video 17 are expanded and demonstrated. The video initially focuses on high caliber opponents and taking actions without the benefit of reads or prior information. The last 40 minutes of the video deals with an opponent that has tighter opening and 3-bet ranges. Mersenneary reflects on that match at the end of the video, discussing what he did well and what he could have done better. Mersenneary Video 20 - Two tables are played at the $500 + 6 super turbo level. Correlated reads, the super turbo mindset and button opening frequency at 10-15 effective big blinds is discussed in detail. Full Tilt red pro Andrew Feldman is an opponent in one match. Skates Video 08 - Short video with good discussion on the differences of 15-20bb versus 20-25bb play and one way to adjust to a player that plays a shove or fold strategy at 15-20bbs. Mersenneary Video 13 - Part two of the August Focus Series (part 1 does not focus on end game play) talks about how reads influence end game play. The video uses footage from gameplay, as well as video of play from HUSNG.com member NewFF. How to utilize exploitive opening and limping ranges against passive and aggressive opponents is also discussed. Mersenneary Video 15 - Two tables of play takes place at the $100 + 2 and $200 + 3.50 super turbo levels. Mersenneary talks about what makes a leak a "big" leak, how to be aggressive in limped pots and when to not bother being unexploitable. Skates Video 02b - Video contains a large amount of hands at the end game part of the match with some interesting hands played OOP. The following mental game, mindset and study approach category videos are suited to those that are professional players or strive to be professional players. Mersenneary Poker Life Coaching - A video that identifies what stops many from being successful heads up poker players and some tips to overcome those obstacles. Mersenneary Plugging Leaks and Planting Seeds - Focuses on identifying key strategical leaks in your game, how and why to watch powerpoint videos and the main ways players fail to use theory to improve their results. Mersenneary Coaching Desk: Xereles (pt1) - Mersenneary talks about turn bet sizing, thin value bets and some 10-15bb play while he reviews $200-500 level regular Xereles' play during a session. Part 2 opens with a hand against h2olga. Rumnchess > Mersenneary Round Two - Rumnchess plays two tables against Mersenneary. He talks about how he adjusts to Mersenneary's play and specific discussed bet sizing and end game play. xSCWx Video 46 - High stakes cash professional jungleman12 is the opponent in this $550 + 20 level video. HokieGreg $550 Turbo - Hokie takes on regular A1sha on the Merge network and discusses some advanced concepts including board texture against good thinking opponents. ITRIED2WARNU Reg Wars 1 - Four games played at the $55 + 2.50 level against strong opponents. ITRIED2WARNU Reg Wars 2 - Matches played against RotarySB including ideal lines, leveling and adjustment analysis when facing good players. ITRIED2WARNU Reg Wars 3 - Three different winning opponents are played at the $110 + 5 level. ITRIED2WARNU Reg Wars 4 - Irontamer and SThoro1985 are the opponents in this $220 + 10 level video. ITRIED2WARNU Reg Wars 5 - Hand reading and bluff catching are specifically discussed in this $330 + 15 level video against HaiducF. ITRIED2WARNU Reg Wars 6 - Matches are reviewed against ShortSharpShock at the $550 + 20 level in this video. mjw006 and PHMERC review - The two coaches team up to review play in PHMERC's matches against heads up pro iamvariance. Croixdawg Video 15 - Croixdawg plays PrimordialAA in this video. Commentary is from Croixdawg's side. PrimordialAA commentary can be found in PrimordialAA Video 08. PrimordialAA Video 08 - PrimordialAA comments on his side of matches played against Croixdawg. Croixdawg's commentary can be found in Croixdawg Video 15. Mersenneary Video 19 - Mersenneary plays Rumnchess on two tables at the $110 + 5 level. 65 minute video with a lot of commentary, including bet sizing and range adjustments against thinking opponents. Other situations include adjusting when a good opponent attacks river weakness and the gameflow concerns of playing in aggressive games. PrimordialAA Video 24 - PrimordialAA squares off against ITRIED2WARNU and discusses hands throughout the match. ITRIED2WARNU's side can be found in his 6th video. ITRIED2WARNU Video 06 - ITRIED2WARNU plays PrimordialAA in this video. He discusses hand reading and how to build an overall strategy against higher level thinking opponents. PrimordialAA Video 06 - PrimordialAA plays PlayItSmart at the $55 + 2.50 and $110 + 5 levels. as well as at the end of a single table sit and go. The hand history is reviewed with both hole cards exposed. Discussion includes a hyper aggressive approach to playing heads up sng poker and the use of leveling to dominate games. PrimordialAA Video 07 - PrimordialAA plays PlayItSmart again, this time with commentary from both of the players. Croixdawg Video 17 - Croixdawg plays regular speed matches against high stakes winner CHEKdezNUTS. ITRIED2WARNU Video 05 - ITRIED2WARNU plays xSCWx on Full Tilt. xSCWx Video 38 - xSCWx plays ITRIED2WARNU on Full Tilt. PrimordialAA Video 05 - PrimordialAA two tables the $110 + 5 level and runs into regulars "ansuz" and "rockets23." The play of these matches is very aggressive. PrimordialAA Archive Video 12 - PrimordialAA plays at the $105-$230 levels against several skilled opponents, including Rumnchess. PrimordialAA Video 11 - PrimordialAA gets into leveling wars with regulars Patrick Baitman and Uship this way on Full Tilt. PrimordialAA Video 12 - Continuation of Video 11, where PrimordialAA plays regulars Patrick Baitman and Uship this way on Full Tilt. ITRIED2WARNU Video 22 - ITRIED2WARNU plays Fydor_8 in this short video. Fydor_8 Video 16 - Fydor plays ITRIED2WARNU in this video. ITRIED2WARNU Video 20 - ITRIED2WARNU plays three matches against regular dalchan25 at the $220 + 10 level. ITRIED2WARNU Video 21 - ITRIED2WARNU plays several success winning regulars, including Mersenneary, in this 90 minute video. A special thanks to member "Qattack." His valuable questions, comments and details on dozens of videos helped this guide and the community tremendously. 1/20/11 - Added ITRIED2WARNU Bluff Catching video to "Bluff Catch" section. Added new section, "Donk Bets." Added mjw006 Donk Bets video to "Donk Bets" section. 1/21/11 - Added Skates 08 and 02b to "Advanced End Game" section. Added Skates video 05 to "Donk Bets" section. 2/21/11 - Added RyPac 35 to "Beginner" section. Added "heads up cash/transition" section. Added "Free intro cash to sng" video to the new category. Added "Deep Stack Part 2" and "Brilliant27 Deep Stack" to "Deep Stack" section. Added section "Videos vs Pros" and added 26 videos to this new category. 7/13/11 - Added PHMERC mid stakes to "Beginner/Intermediate" section. Added mjw/phmerc review and HokieGreg $550 turbos to "Professional Opponent's" category. Added "Mental Game Pros" section and added Mersenneary Life Coaching and Mersenneary Plugging Leaks to it. Added new section "High Stakes Videos" and added Mersenneary Coaching Desk 1 and 2 to the new category. Added xSCWx 53 and 54 to "Intermediate Videos" section. Created "Early Blind Levels" section, added "Barewire's Early Blind Fiesta 1 and 2" to new category. Added Fydor 7/11/11 to "Beginner Videos." Added Cog Video 58 and Cog Hyper Turbo Video to "Super/Hyper Turbo Starting Point" category.